There are many different peace movements in this world that do important work. We are a completely different kind of peace movement that approaches mankind with the overall vision of world peace based on the highest ideal of mankind, the11 fundamental values. Our approach to achieving world peace differs fundamentally from other peace movements. Our understanding of peace goes far beyond the mediation of armed conflicts and the conclusion of formal agreements and treaties. Our foundation for world peace is the mental and spiritual development of every human being, the development of their awareness for peace. Motivating, developing and supporting this inner process of growth is part of our vision. The embrace and realization of individual peace is what first allows for additional steps in awareness towards global and universal peace. We would appreciate support and contributions to make this great global vision a reality. Become a SUPPORTER and turn towards this vision of a peaceful world. Turn towards this vision personally to encounter what potential you have in yourself. Turn towards this vision with your soul to experience that peace is also present in you. Turn towards this vision with your spirit to recognize the unity of all, the unity of which you are part. We would be happy for your support at any level so expanded awareness can be possible for everyone. Thank you! We are delighted to have the support of people who are turning to us out of their longing and feel themselves united with our vision in their hearts, so they can work together with us to implement this vision as a pioneer, participant, co-creator, patron or supporter. This is how visionaries come together for world peace. This is how pioneers come together for world peace. This is how co-creators come together for world peace. Let us realize this vision together, as communicators, co-creators and role models. The WORLD TOUR for PEACE is being organized and implemented by the nonprofit association Vision Peace Foundation Germany e.V. This journey for peace is a nonprofit trip and is supported by patrons, donors, contributors and sponsors worldwide. With our new and comprehensive definitions of “sponsor, donor, patron and supporter” above, we are exploring new paths together to form a community of visionaries and actors. In practical implementation, this also includes signing and issuing clear sponsorship contracts, patronage and donor agreements as well as donation certificates. For the sake of transparency, we publish a list of donors, patrons and supporters with their financial contributions, if they agree. We look forward to meeting you and working with you to find the type of support and donation that suits you. Please contact Beate Knopp or Mechthild Assmann from our organization team. They and their teams are reliable partners and contacts for assisting supporters. Donate here easily via Paypal. With a click on the button you get directly to the secure page of Paypal. Country governments, humanitarian organizations, peace organizations, animal and environmental organizations, associations with a focus on peace for humans, animals, plants and Mother Earth are invited to cooperate with us. As a company you can support us, our work and our World Tour for Peace. We are looking forward to hearing from companies which would like to contribute to peace and assume responsibility through their cooperation. We also warmly welcome artists who can support our local events through their art and engagement. We look forward to cooperation with people in every country. 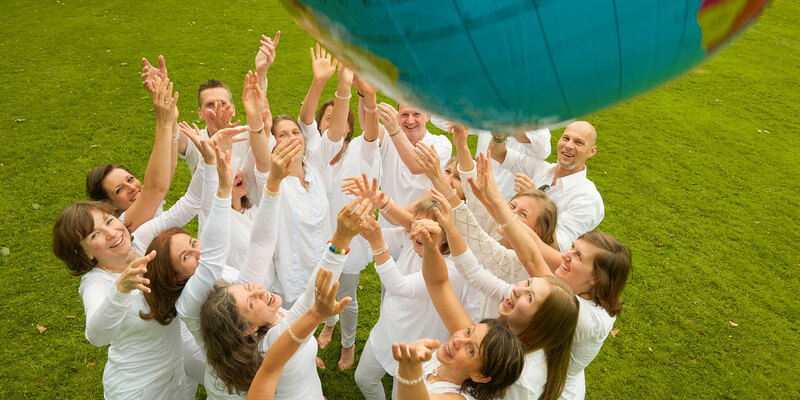 If you are interested in meditating, praying, dancing, singing and talking with us, or if you know suitable places where this is possible in your city, please contact us. Thank you very much! You can find our itinerary here. Our Earth longs to become a planet of peace. Join us! Be as well a peace ambassador through your peaceful thinking, feeling and action, through your true expression, through your loving relationship with yourself, with your fellow human beings, with animals, plants and Mother Earth. Live your free choice in connection with responsibility for each of your actions, and recognize the unity in everything. Every heart we touch and open on this tour will become a point of radiant peace on Earth. You can already support the expansion of peace today. Write the message “Peace begins in me” in your mother tongue, and take a photo of yourself with this message. Upload your photo, provide your first name and place of residence, and a point of radiant peace will shine at that location on the map. When someone scrolls over your point of peace, your photo will appear.